There’s a fair bit of coverage of Tasmanian band the Wolfe Brothers on this site, and there’s a reason for that: they’re great. Complete professionals who put on amazing live shows and continue to evolve because they want to make the best music they can. It is always a pleasure to interview them, and this time I chatted Tom Wolfe about their headline show at The Albert on 23 January during the 2019 Tamworth Country Music Festival, and about yet another big year during 2018. It’s been yet another year of underachievement for the Wolfe Brothers: five Golden Guitar nominations, an ARIA nomination and national tours. When are you guys going to start putting in some work? That’s a great question! One of the things we’ve been really good at is a great work ethic and I don’t know whether that comes from our parents but we’ve always kept gigging, kept working, kept writing … and it’s really cool. It’s really nice to see all this hard work starting to pay off a bit, with these nominations – especially at the ARIAs, it was so nice to be there and be a part of that. It was really gratifying. It felt like we were doing the right things. The ARIA nominations in that country music category were a good representation of Australian country music. I was really pleased to see Fanny Lumsden in there with you guys and the others. Absolutely. One of my favourite country music albums of the year has been Fanny’s album [Real Class Act]. It’s a fantastic album. But you’re right: we’ve really grown in Australian country music and we’re now recognising that diversity is the key. And the key is also picking each other up instead of putting other people down. That’s how we really feel, and I feel like we’ve had a lot of support this year, so that’s been really, really nice. The Wolfe Brothers have a reputation – a good one. It involves them being a country rock band, and always putting on a great show, and being very, very entertaining. They will put the same amount of energy into three songs at the Peel Street Fanzone as a massive festival show. 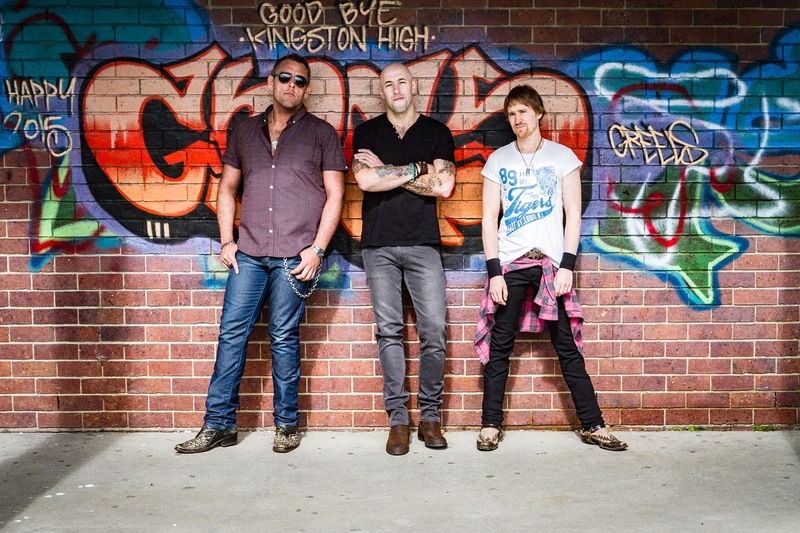 They’ve been Lee Kernaghan’s touring band for years, as well as playing in the support slot at his shows, so they’ve had lots of opportunities to develop their skills and they’ve taken them. Nothing at all is wrong with what they’ve been doing, so it wouldn’t make sense to change it. More than that, they’d have to be brave to change something their fans love. Yet change it they have. Country Heart is the Tasmanian band’s fourth studio album, and when I last interviewed guitarist Brodie Rainbird he mentioned that it was going to be very different to the first three. For the first time they had asked popular producer Matt Fell to work on an album with them, and Fell’s direction was not just completely different to what they were used to but they loved it. And that enjoyment of the experience is evident all over this record. 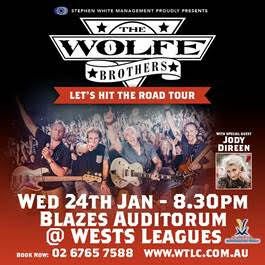 After another massive year The Wolfe Brothers are taking their Let’s Hit The Road Tour to the Tamworth Country Music Festival, playing one big show at Blazes Auditorium at West Tamworth Leagues Club on Wednesday 24 January at 8.30 p.m. They’ll be supported by NZ sensation Jody Direen. Towards the end of 2017 I caught guitarist Brodie Rainbird on a rare day off and found out what he and the Wolfes, Nick and Tom, have been up to lately, and what’s ahead this year. I’m good. The boys and I are enjoying a few days at home – we haven’t had many of those this year. Does anyone even recognise you any more? [Laughs] They still hear from us. We don’t let them forget. How was 2017 – what were the highlights? Were there any lowlights? It’s been flat out. We’ve been over to Nashville for a month. We’ve written a new album. Then we came home and we started touring with Lee Kernaghan. So we’ve done his tour, which is now over. In between all of those dates we’ve done our own dates. We started our own tour. And then in between all of that we’ve been spending time in Sydney recording the new album. Is it unusual for you to record in Sydney? Yes. We’ve recorded one song – it was with Matt Fell at Love Hz Studios. We recorded one of the first songs we ever put out with him, seven years ago. So we’ve done a full circle: we’ve been to Nashville, we’ve come all the way home. 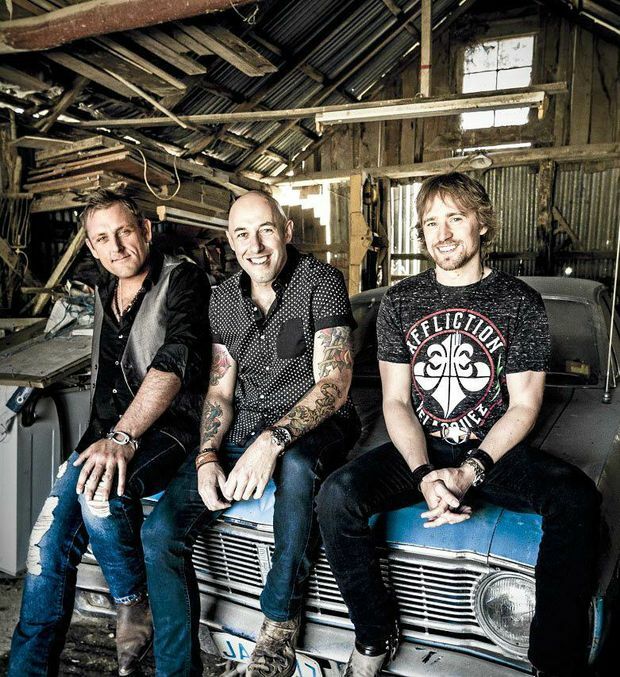 The hardest-working band in Australian country music has to be the Wolfe Brothers, but they still found time to invite Shannon Noll to join them for a special show at the 2017 Tamworth Country Music Festival on 25 January at Blaze Showroom in West Tamworth League Club. Towards the end of 2016 I caught up with Wolfes guitarist Brodie Rainbird to ask about the gig, the band’s massive year and what lies ahead. Your This Crazy Life tour– how did it go? It was so good. For all intents and purposes it was a complete success. The boys and I were so happy with that. We were really nervous about going out on such a big tour and it was all on us, money wise and profile wise and advertising. All this big, proper adult stuff – it was all on us, there was no one else to blame if no one showed up. If it didn’t work we were up the creek. It was a great success. All the other artists brought something that none of the others could bring to that kind of show. It was fast paced. The punters loved it. It was constantly changing. People didn’t want to leave to go to the bar and get a drink because they weren’t sure what they were going to miss. It was awesome. Could not be happier. And maybe the only thing you could have done differently was have more dates. At the end of it we all felt a bit sad, like, ‘Why are we stopping again?’ But it definitely feels like we could have toured for another six months with that show. I know it was only a fairly short tour. But, as I said, the whole thing was a bit of a gamble and we didn’t actually know it would go that well. Maybe we can do it again [in 2017]. As it was sort of a test of concept and it’s worked, you could roll it out – the only thing is whether you have enough time to do a longer tour given all your commitments. Yes. It’s just a case of ‘do you want to be on two tours at once?’ because we’re going to be touring with Lee Kernaghan and can you do both at the same time? I reckon we could. Another feather in the cap. Well, if any band can, you guys can. [Laughs] Bring it on – bring it on, I say. Isn’t that your band motto? Something like that, yes. I think the official motto is ‘you gotta do gigs’. So if we’ve gotta do gigs, we’ve gotta do it. I think the experience shows in the way you play because your shows are always entertaining. And speaking of entertainment, I’m here to talk to you about your 25th of January show with Shannon Noll at the Tamworth Country Music Festival. So this seems like a marriage made in musical heaven – how did it come about? It really is. It’s surprising that it’s taken us this long to do a gig with Shannon, because we love him. We’re all country boys; we all grew up in a similar way, on a farm. We all love our old Aussie rock and Shannon is now taking a more country approach to how it does things, and that’s really cool. The universe just brought us together one night after a gig that we’d both headlined at, and it’s taken us this long to find some spare time to actually be able to put on a gig with him – and where better to do it than Tamworth on Australia Day Eve. How are you going to divvy up your time – are you guys playing first? Is he? Are you sharing some songs? How’s it going to work? I don’t know yet! Being that it’s not a tour, it’s just a one-off gig, I think we’ll just go with the flow. We’ll just have some fun. We’re going to obviously share some time on stage – towards the end will probably be everyone on board, get everyone out on the stage and just really rock it out. I was just thinking about what you said about the mini-tour and maybe trying something in 2017 … I’m foreseeing perhaps Shannon joining your line-up next time. Maybe. There might have already been some talk. Nothing confirmed but it’s a cool idea and we’ll wait and see what happens. As you said, that tour was all on you and organising it was moving into entrepreneurial behaviour, in a way – not that you guys haven’t always been business focused and that comes across in how professional you are, but taking those sorts of risks is a way to move your career forward and it’s exciting when it works but it is always nerve wracking. It looks like the impetus is there to keep going, though. Yes – and people see the success more than they see the failure, because we had to fail so many times to get that success. We tried quite a few things in the past that hadn’t worked and we were due for some good luck, you know. We were due for a taste of success and we got it, and we’re so grateful. There’s a lot of clichés about learning from failure but I would think in the case of your band, you might have learned from the failures but it seems like they give you a whole lot of motivation to keep working. What I find interesting about the Wolfe Brothers is that success seems to be a by-product of your willingness to work really hard. Well, this way of life is all we’ve ever wanted to know. When we first got together in high school, in the very early days, this was all we ever talked about doing. We dreamed about putting arena shows on and how we would open them and the big curtain would drop and we would have lights going on over our heads, all this sort of stuff. So we just keep our eye on the prize, enjoy the success when it comes and when the failure comes it’s just gigs – that’s how life is, you just have to do it. I think that is a very good motto for any kind of work. But back to Tamworth: apart from that show with Shannon I would think you aren’t doing another show at the festival, but is there anything else you’re looking forward to? Just looking forward to enjoying the festival because we missed it last year – we were in Nashville writing and recording. Really looking forward to getting back. We do a lot of media stuff – radio interviews all day every day, they’re always cool fun. I wouldn’t mind getting out and seeing a few gigs, actually. Our festivals are usually so busy we don’t get the chance to enjoy them but I’ve decided to put my foot down and I’m going to see a gig. It’s going to happen. What a revolutionary idea – seeing music at a music festival! [Laughs] It’s usually the last thing we get to do. And it’s not just seeing the music – it’s seeing the people you know. You can catch up with them fleetingly at a radio station but if you get to go to the gigs you can probably spend a bit more time. Exactly. And it would just be nice to be out there supporting some other artists. As we come towards the end of 2016 – and leaving the This Crazy Life tour aside – what have been your other highlights? Our trip to Nashville was pretty great. We did some low-level touring over there. We did county fairs and we travelled all up the way up the Midwest. We did ten-hour drives a day in our old Chev that we bought. That’s probably a trip I’ll never forget. We worked really hard there; we met some great people. We sort of tested the waters to see if what we do would translate over there. It does, and people really enjoyed the shows and they love our accent. All they wanted to do was keep asking us about Keith Urban, for some reason. Because Australia’s so small you must all know each other. Yeah, yeah, exactly – we must have grown up next to him, right? He plays music. You talk the same. You must be the same person … But it’s funny – you tell people over there that you’re from this place called Tasmania and they’ve got no idea where that is. It sounds exotic – ‘oh my god, your accents’. So that was really cool; it was a great trip. We did a bunch of writing as well so we’re demoing up some songs for maybe the next album. That was a huge thing. The tour – god, what else happened this year? So much stuff. The ARIAs were a huge thing to be a part of [the Wolfe Brothers were nominated for best country album]. I don’t think you can go to an ARIA award ceremony without witnessing Australian music history, which we got to with Crowded House being inducted, so that was awesome. Met Roy and HG – that was really nice. They’re a good pair of guys. It’s been such a big year. We brought the album out. Hopefully we do some new singles soon from that, but we brought out the best album we’ve ever written and recorded, and hopefully the next one I can say the same thing as well. But it’s been a massive year – I hadn’t realised until I sat down and talked to you, how big it’s been. Only fifty-two – yeah, that’s crazy. And we haven’t been home. This is the longest we’ve been home all year. After such a busy year, are there any lowlights? One low point, which was [when we were] over in Nashville – we got halfway through Kentucky and our car broke down on the side of the road. That was bad. That was really bad. The alternator broke. We had no electricity in the car. Couldn’t even push-start it because the battery was dead flat. And it was freezing cold outside and there were trucks rushing past the freeway. We had no lights. They didn’t even know we were there. So it was kind of scary. But we got through that – we managed to get a tow truck out. But that’s the only one that comes to mind, it’s just all been hard work and good times. Hopefully you didn’t miss a gig because your car broke down? No, we didn’t miss a gig, that was the thing. We managed to get there at about five a.m. We got to the hotel, checked in, went to bed, got up a couple of hours later and went to do the gig. That was an adventure. If I think of all the hours we spent on the road in the last few years, that’s the only time that’s ever happened – and it had to happen in a foreign country. That’s rock ’n’ roll, I guess. That’s rock ’n’ roll. That’s gigs. That’s life. That’s how it is – wouldn’t have it any other way. Having that kind of experience in the United States, does that change your music in a way – you seeing that there’s a completely different sector to your audience now than the one you’ve had in Australia, so do you start to think differently about how you communicate to the audience and what sort of music you might play for them? Absolutely. Stuff like that, it’s hard not to be influenced by it. Every corner we take, we learn something, and being in the US was a big learning curve too. Some things had to be approached a little differently – we had to learn to talk a bit slower because the accent, they think we’re from England and they find us a bit hard to understand. Australians are very lazy in the way we talk and the boys and I are probably the worst in the world at it [ed. note – Brodie actually speaks very clearly!]. So we had to learn to fit in a bit better. We watched a few Keith Urban interviews and realised that that’s what he was doing as well. He spoke very slowly and clearly so that people would understand what he was saying. Just little things like that you pick up along the way. We changed the way we did the gigs and played some different songs we probably wouldn’t normally get to play in Australia because we don’t have the big radio airplay for country in Australia. But over there one of the biggest things is country radio – it’s all over the [US]. As you head into 2017, you’re obviously kicking it off with a bang in Tamworth. Lee, of course, has you on the road again. And you mentioned that you wrote some new songs, possibly for a new album, so that’s on the cards for 2017? Definitely on the cards. I think we will go back to Nashville to write and record again because it went so well last time. We know it works and we know when we put the pressure on we can really write some cool stuff and get it done. And we’ve just a week in the studio with Lee, cutting his new album too. [Laughs] Again, I remind you, Brodie: fifty-two weeks in this year. He would be really unlikely to find anyone more experienced – you’ve been playing with him so consistently – so it makes sense. Yes, and Kerno’s always had a formula that’s always worked for him, and to step outside that formula and take a risk on us again, because he’s obviously already done it [with touring], was such an honour. We had Garth Porter in there, who’s produced almost every single Kernaghan album and it was a bit of a thing for him, too. I think he realised after the first day that this was not going to be your typical album. We did things completely differently. Everyone was sitting there getting a feel for it and how it was going to work, and it was awesome, there were no hassles at all. Everyone was really enjoying the change in the studio, the different mindset. It was really cool. 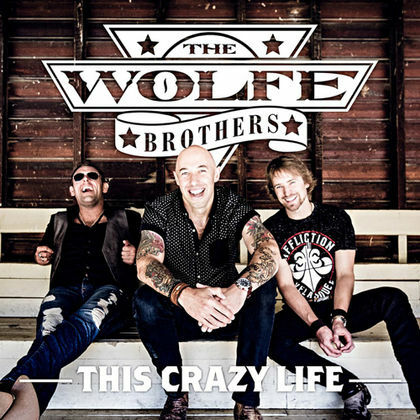 The Wolfe Brothers’ latest album is This Crazy Life. The Wolfe Brothers released their album This Crazy Life earlier this year and they have decided to apply that title to their ‘mini-festival’ tour, starting in Tasmania in early October – dates below. I spoke to Tom Wolfe (at left in photo) about their year so far, their plans – and their parents. You’re in Nashville as we speak, and I know the band has four months in the US before coming back for the This Crazy Life tour. Are you staying in Nashville and radiating outwards from there? We’re based here. We’re sort of out every weekend touring, whether it be a festival or at a fair or doing a support slot – we’re out of Nashville three or four days a week. When we’re in town we’re doing a lot of writing with newer artists and lots of different writers around town. It’s been great. It’s been really busy. We’ve done some fantastic gigs. We’ve opened for Dustin Lynch, Eli Young Band, Chris Janson, Locash, played at a country festival that has attendance of over 40 000 people. It’s been a pretty amazing trip so far and for us it was all about seeing if what we do translates in this country – whether people understand it – and the reception’s been fantastic. Better than we could have hoped. We’re over the moon. It seems like an efficient use of your time, as well, to get that writing done when you are in Nashville and then go and play. An efficient use of time and a good balance, so you’re not feeling too cooped up, because I imagine you guys don’t like being cooped up. Absolutely not [laughs]. We love it. It’s the town where you can write five days a week – you can write seven days a week if you want to – with different people every day. When you’re a creative person it’s a fantastic thing and we’re really enjoying it. We’ve written some great new songs. Just working on our craft, you know. I think you can never have enough songs. So, who knows, some of them might pop up on our next album – you never know what the life of a song will entail. These new songs, do you ever test them out on the road before you decide what’s going on an album? None of these we have, but with the songs for This Crazy Life we did – we had a few that we were working and we felt let’s try a few of these out live. I think with the whole of the album we kept to the idea of playing these songs live in our minds a lot more. Playing live is a big part, if not the biggest part, of this band. We really made that a focus and I think we got a bunch of songs that feel great and go over great and are a lot of fun to play live. The album is called This Crazy Life, which I feel is something of an ironic title because I maintain that you guys are among the best-organised bands in the business. But how is the crazy life going? [Laughs] It’s great. The song ‘This Crazy Life’, that’s kind of what our journey has been for the last four years. We started long before that, of course, in the pubs and bars, and moved to the rodeos and B&S balls. There was a time when we were playing weddings and birthdays and engagements – anything. It was the Australia’s Got Talent journey that was the one thing that gave us that little push into the direction we wanted to take the band – into touring, releasing albums, doing all that we’ve got to do over the last few years. We’ve pretty much lived out of a suitcase. It’s been highest of highs, lowest of lows, but as the song says: we wouldn’t have it any other way. That’s completely true. It’s been an amazing ride so far. I don’t know if this qualifies as a ‘low’, although I suppose it would be: you’ve lost one band member since the last album. Do you have a new permanent drummer or do you find one depending on where you’re playing? It was a bit of a low but with Casey we totally respect that he’s got a really young family – two boys under the age of three – and he didn’t want to miss out on the time with them. Casey does as much as he can with us in Australia, which is great. And over here in the US we’ve found a drummer, a young guy from Texas. He’s a great guy, he’s really into the music, and he wants to see us do as well as we can. It is a bit of shame [about Casey] but we totally get it, we totally respect it, and I think it’s very commendable to put your family first like that. I think he’d regret it otherwise, down the track. The tour you’re coming back for in October is kicking off in Tasmania – I imagine that was a Wolfe Brothers request. Absolutely. We want to get home at some point [laughs]. It’s going to be something special: seven acts from three different countries. It’s a mini festival on the road of new country music. We just what to take it out to people. There’s a lot of country fans around Australia so we want to take it to them and we also want to encourage people who don’t listen to country, or haven’t listened to country in the last ten years, to check this out. You’re going to get a great showcase. We’re a country rock band; we’ve got Gord Bamford coming out from Canada. I don’t know if Australians realise but he is huge in Canada – he is the man of Canada, you know. Jody Direen coming over from New Zealand – she just won the NZ Country Music Awards artist of the year. We’ve got Christie Lamb, Golden Guitar winner. Caitlyn Shadbolt, of course, was on X Factor. Troy Kemp from McAlister Kemp and Craig Heath. We really wanted to do something different. We didn’t want to just do one show, one support – we wanted to involve a lot of people, just mix it up, take some new music out to people on the road and get them excited about it. Will everyone play a short set? Everyone’s going to play some of their own stuff then we’ll probably jam on things together. We’re still working everything out. It’s going to be fun and with that many people on stage there’s probably going to be some surprises [laughs]. We can’t wait to get back home and put some rehearsals together. Bring it on, I say. The unseen part of touring is rehearsing – good luck getting all of those people together in one place. It was hard enough organising the tour! We’ve toured with Christie Lamb before with Lee [Kernaghan] but we haven’t toured with a lot of female acts before so that’s going to be something new and a different dynamic to the whole show. It’s exciting – really exciting. And, of course, country music is unusual in that there are a lot of female artists and a lot of women in the audience, so that balance should work really well. Absolutely – and that’s what we wanted to do. We wanted to give people a real showcase. There are some seriously talented people in Australian country music coming up and if we can give an opportunity to take some of those people on the road and support them and get them out there playing in front of people, I think that’s a really positive thing for the fans, for the artists, for everybody. Now, after all this time touring and intensive time together, do you and Nick [Wolfe, Tom’s brother] still like each other? We love each other very, very much [laughs]. Honestly, it’s great – we’ve all got on really well. We haven’t been home a lot at all over the last year – we were over here in Nashville from November to February, just three of us, and now we’re back here again. And when we were at home we did 30 to 40 days with Lee Kernaghan. We’re pretty used to living with each other. We love it, you know. If there is any tension or anything like that we try to channel it into a new song, being creative, which I think is the smart way to do it. Just the fact that we’ve done it together for so long – we get on very, very well. I think that comes through. We wouldn’t be able to do it otherwise. It’s really a lot of fun. And your parents must be very proud of you both, I’d imagine. They’re over the moon. What we’re doing now is kind of what our dad always wanted to do but he never really got the opportunity, with the family farm and stuff, so he’s just over the moon that we’re going it and Mum’s really proud. They’ve been incredible parents and incredibly supportive over the years. It’s been a great ride for us but there’s some sacrifices you’ve got to make to try to live out your dreams and they’ve been there for us and believed in us every step of the way. Couldn’t have done any of it without them. It seems very much like you honour them by performing so professionally, by running your careers the way you have. My sense is that every opportunity the band is presented with, you say yes. Not recklessly – you see those opportunities, you identify them as opportunities and you accept them, and then do your absolute best with them. We’re all very lucky. It’s not just me and Nick – it’s Brodie [Rainbird, guitarist] as well. We’ve both got great sets of parents who brought us up very grounded. We’re very proud of what we’ve achieved so far. As you said, very thing that’s been thrown our way we’ve worked really hard and made the most of every opportunity. We’re really proud of that. We’ve been able to do some amazing things that we’ve only ever dreamed of and are now coming true. It’s bloody awesome [laughs], if I can be really Australian. Given that Lee keeps booking you up, has he booked you up for next year? Yes. We’re just trying to make that all work. There’s some cool things in the pipeline for next year – I think that’s also going to be just as busy. Yeah – awesome, fun, and I’m glad we just keep doing it. We love making music, we love being on the road. We appreciate everyone who lets us do it. Country rock isn’t for everyone. A lot of the time I’d say it isn’t for me – and that’s probably because some of it is overproduced, overplayed, underwritten and insincerely delivered, and that gives the genre a bad name. When Tasmania’s Wolfe Brothers emerged as country rock artists, supporting Lee Kernaghan on tour as his band and support act, I was sceptical. Then I was asked to interview a couple of the band members on separate occasions and it became immediately clear that their commitment to their music came from a well-established and passionate place. They were professional, astute and hardworking, and they simply loved playing music. Seeing the Wolfe Brothers live affirmed all of that: their shows are vibrant and entertaining, and they engage the audience from the first note. Ideally, all that is put aside when reviewing an album, because the album has to stand on its own merits. It’s impossible to do that, however, because all that professionalism and passion is in the Wolfes’ new album, This Crazy Life. This is country rock done very well: articulate lyrics, sensitive playing and producing, and attention to detail throughout. There’s a great balance of up-tempo songs that have the right amount of rowdy with slower songs verging on ballads. It’s a Goldilocks album: just right. It’s a mystery how the Wolfe Brothers have been album to sustain their touring workload over the past few years and still find time to create albums; I suspect it’s because, while they may like to present an image of being wild musicians, they’re actually highly organised, plus they understand what it means to have a relationship with their fans. Albums are their way of staying connected to their fans when they can’t be there in person. In short: the Wolfe Brothers converted me to country rock. I suspect they’ll convert you too. This Crazy Life is out now through ABC Music/Universal.